Dispatchers can quickly assign bookings to vehicles simply by dragging the booking onto a vehicle. Swapping bookings between vehicles is just as easy. Summary information about bookings is instantly available by hovering the mouse over the booking. There is no need to open each individual booking. 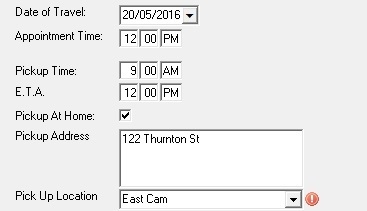 This provides the dispatchers with the critical information they need to simply assign bookings to vehicles. All vehicle pools can be displayed on the one form. By default, bookings are displayed as surname – destination, however, it is easy to change this to suit your preferences. The software collects the vital information that is needed by dispatchers in order to allocate and prioritise the booking requests. This can be fully customised for your organisation. By default, all fields are mandatory, requiring booking requesters to discount certain conditions. This process reduces the need for dispatchers to chase up information that booking requesters fail to complete, saving time and unnecessary delays. Community Transport Booking Software comes with multiple free support options. The comprehensive user manual includes an in-depth getting started section, a user guide, and a detailed field reference. There are also video tutorials. I.T. Guaranteed welcomes contact for support by email, phone or skype. Remote desktop support (Quick Support) is available directly from the menu bar. Community Transport Booking Software automatically calculates the travel distances as well as the client fares. No matter how complex your tariffs are, rest assured that they will be automatically calculated for each trip. Charges can also take into account discounts, which apply to certain clients. Either journal export the billing data to your accounting system, or use the optional invoicing & accounts receivable module. Double entry will be a thing of the past. Intuitive features include a comprehensive find box right on the main toolbar which can be used to find bookings by surname, date or booking ID, or find drivers make the software a pleasure to use. Dates may be selected with menus, calendars, or simply by pressing quick keys such as + to advance 1 day. It’s the little extras that make day to day use of our software less stressful. Our portable executable program is lightning fast and used by the majority of our clients. It can be installed with normal user privileges. It updates automatically and therefore requires no assistance from your I.T. Department to install the clients or maintain the software. Alternately, your organisation might prefer to use the responsive web-based form suitable for smaller screens. Most of our clients prefer to keep all their data internal and on their own servers and be responsible for their own backups. This ensures the fastest possible data request times. Alternately we can assume the responsibility and arrange hosting for you and perform regular backups according to an agreed schedule. For more detailed information, please download our product feature and benefit guide. If you would like a demo to trial, please contact us using the form below.